Notes: Percentage was calculated as (deaths occurred in a place/all deaths) x 100. Excludes all deaths from external causes defined by International Classification of Diseases, Tenth Revision (ICD-10) codes V01-Y89 and cause-of-death codes U01–U03. Deaths in hospice and all other places include those in a hospice facility; all other places other than hospital, nursing home, and home; and unknown place of death. The category “hospice” was introduced with the revised death certificate in 2003. The number of states using the revised death certificate grew from four states in 2003 to 46 states and the District of Columbia in 2014. Data Source: National Vital Statistics System. 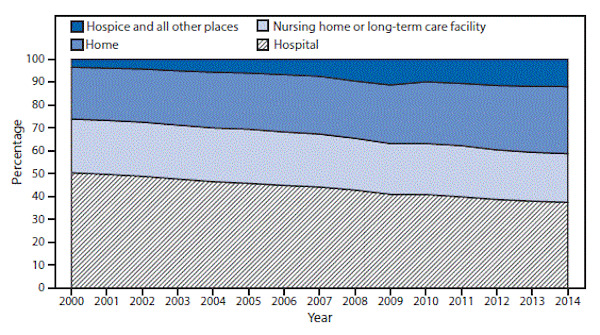 Underlying cause of death data, 2000–2014. This entry was posted in Medicine and Society Data Watch on April 13, 2016 by Genevra Pittman.